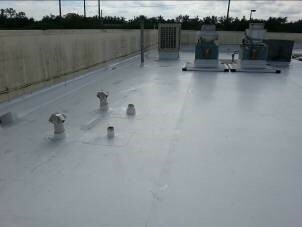 TPO Membrane roof installed at Westwind of Boca. TPO Membrane roof is a single-ply roofing membrane and has grown in popularity due to its durability and energy efficiency. According to a newsletter written by the ATSM (American Society for Testing and Materials), TPO-based products have been in use since the 1980s, including in the automobile industry. TPO products have been used in roofing since 1989. The product has highly reflective properties that contribute to lower energy consumption. When installed properly, it is extremely durable and wind-resistant. It is resistant to tears, punctures, and impacts and has excellent flexibility, allowing it to move and “flex” with the building. TPO membranes are installed by adhesion, mechanical attachment, or through ballasting. The life of the product is dependent on substrate to which it is applied, installation, roof slope, environmental conditions, and proper maintenance. The most important factor that contributes to the longevity of this roof system, like of any roofing system, is a proper installation by qualified individuals. Similarly, it needs to be properly maintained and inspected on an annual basis.